Racing to find the right hire is tricky – finding the candidates with the right training and interpersonal skills is not an easy feat. In honor of the Kentucky Derby, we’ve broken down how to navigate the hiring “horse race” and choose your organization’s next winners. 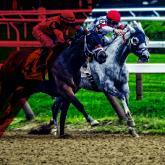 From application through the final stretch, knowing how to tackle the theoretical hiring horse race can help you weed out the potential winners and place your bets accordingly. Finding the right match for a job starts by finding candidates who have the right skills and can handle the job requirements. Hard skills include the learned knowledge base and capabilities specific to different jobs and career paths. Unlike soft skills, hard skills are achieved through education, training, and job experience; they’re one of the first things recruiters consider in the application process, with 69 percent of HR professionals stating they’re evaluated before looking at a candidate’s soft skills. These candidates come out of the gate hot, taking a strong lead with their hard skills – luckily, technology can help find and select the most qualified talent during the application process. A robust applicant tracking system (ATS), like iCIMS Recruit, allows companies to set job-related screening questions tied to specific positions. Screening questions can also be weighted and set to “knock-out” unqualified candidates from a talent pool immediately if they don’t fit the necessary criteria, so recruiters can narrow down their talent pool and focus specifically on qualified candidates. Although hard skills are a vital factor in the recruitment process, soft skills are equally important, and are often the dark horse of hiring. Soft skills, or people skills, are interpersonal competencies we use when communicating with others. Traits like collaboration, creative thinking, and communication style fall under this skillset. And while hard skills might get a candidate’s foot in the door, their soft skills are typically the ones that make the greatest impression. In fact, 56 percent of HR professionals state they value interpersonal skills over technical knowledge, as they drive career advancement and ensure a strong cultural fit. Soft skills can also be evaluated in as early as the application process. Recruitment teams and hiring managers should align on the soft skills they’re looking for in potential candidates to expedite qualifying resumes and applications. Software can help too – a powerful ATS like iCIMS Recruit can search and scan resumes for specific keywords, filtering out talent pools and ultimately saving recruiters time and effort. Then, the interview process allows interviewees to really show off their interpersonal skills on a deeper level. Hiring managers should be prepared to ask behavioral and situational questions for better insight into work ethic and business etiquette. By asking the right questions, hiring managers can see if their dream candidates are truly a good fit for the organization. If there’s a tight race for a role, the candidate who’s chomping at the bit for the position might ultimately be the winner. While soft and hard skills are important, being proactive and showing genuine interest in the job can help hiring managers make their decisions. Even a simple thank-you note following the interview should be taken into consideration. At the end of the day, hire the person who truly wants to work for your company, not just the person who looks best on paper or has the best interview skills.